How did it come to pass that the “draining of the swamp” would become a core aim of the Trump administration, impacting everything from judicial appointments to the federal budget and regulatory policy? The answer to this question and many more lies in the scholarship of John Marini, Senior Fellow of the Claremont Institute, collected in his new book, Unmasking the Administrative State: The Crisis of American Politics in the Twenty-First Century. Join us on Tuesday, February 26 as Michael Anton, Lecturer and Research Fellow at Hillsdale College and Senior Fellow at the Claremont Institute, interviews the author about this important and timely new book. 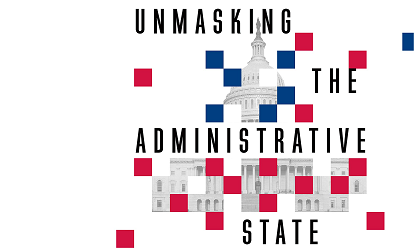 Free copies of Unmasking the Administrative State will be given to the first 50 guests. Additional copies of the book will be available for purchase. John Marini, a professor of political science at the University of Nevada, Reno, is a graduate of San Jose State University and earned his Ph.D. in government at the Claremont Graduate School. He has also taught at Agnes Scott College, Ohio University, and the University of Dallas. He is on the board of directors of the Claremont Institute for the Study of Statesmanship and Political Philosophy and a member of the Nevada Advisory Committee of the U.S. Civil Rights Commission. Dr. Marini is the author or co-author of several books, including The Politics of Budget Control: Congress, the Presidency, and the Growth of the Administrative State; The Founders on Citizenship and Immigration; and, most recently, Unmasking the Administrative State: The Crisis of American Politics in the Twenty-First Century.